What have ‘apostle’, ‘missionary’, and ‘disciple’ got in common? They are all the names of minibuses that take African Christians to African churches – often in South London! Now to be fair, many Africans do make their way into local non African churches. Catholic and Anglican churches have grown with this influx. It is also sad but true, that thoughtful Africans have experienced rejection and discouragement in some white led churches. Also, the historic denominations in Britain, increasingly influenced by culture rather than the Bible, come across as faithless and lifeless. One African told me ‘It is strange to hear a white man talk about God.’ Africans have been sworn at for sharing their faith with white colleagues. It is easy to understand why Africans would retreat into a less hostile environment. 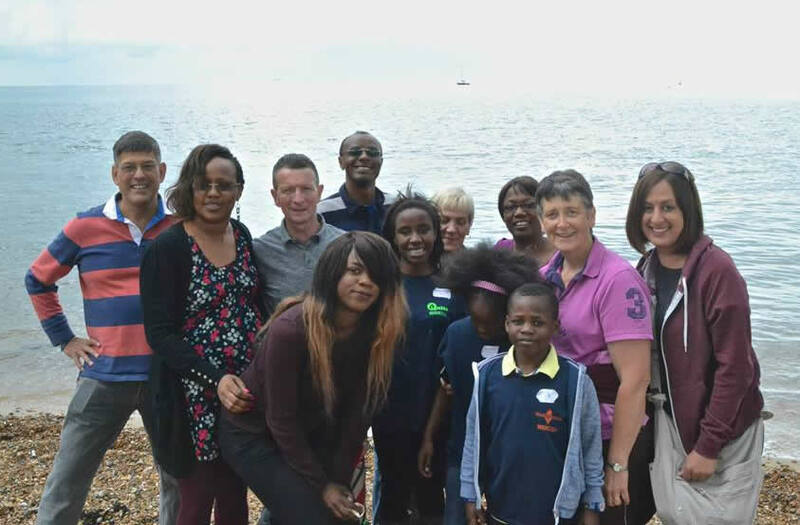 But I want to suggest here the better response is to join mixed race churches which love the Lord Jesus, and who serve the gospel in their local area… taking to them the encouragement and vibrancy of African faith. I wonder if for many black-dominant churches, meeting together is more ‘reunion’, than Christian. Immigrants from different parts of Africa, like to travel across the different parts of London, to meet together with friends from the same locality ‘back home’. That’s why the local black-led church is by-passed (even though it is of a similar style and has a similar programme to offer). It doesn’t have the same familiar people in it. So Kenyans find Kenyan churches, Nigerians start up churches for their regions, and the minibuses start up every Sunday to taxi people to wherever their ‘club’ gathers. ‘Local’ church takes on a whole new meaning. It means ‘local’ to where you were back home, not local to where you are now. Now it is understandable for people to seek familiarity when they find themselves in a new city. Apart from the greater ability to relax into friendship, there is the additional advantage of a trusted network providing support for those who want to find work, deal with immigration issues… etc. Understandable – yes. Christian – no. Well, not if you get your Christianity from the Bible. It looks Christian. The meeting will be called a ‘service of worship’ and great enthusiasm may be displayed. But it is more according to African custom than Christianity. Anyone outside that particular African culture is likely to feel excluded. The Bible pattern is helpful. When the apostle Paul went to new places, he’d join a church that already existed (e.g. Rome – Romans 15:24). And if there wasn’t one, he set up a church on site (e.g. in Philippi – Acts 16:1). First, real Christianity is about opposites being united in Christ. Read Ephesians 2 and it is astonishing to find two groups who were polar opposites to each other, loving each other as brothers and sisters. Jews and Gentiles were so dissimilar they hated each other. But following Jesus united them. And this kind of mixture of opposites in church is actually the biggest miracle on view in the world today! Paul says in Ephesians 3:10 that when invisible heavenly powers stare down at these gatherings of human diversity, they understand they are looking at nothing less than the ‘manifold’ (Literally “many coloured”) wisdom of God’! Those ‘powers’ wouldn’t pay a second glance at the gathering of people in most black churches. They’ll see more difference in the local pub! I guess the interesting insight a very mixed church gives us about God is that he is the Creator God – so every tribe and language seeks him together. He is not a tribal God. Second, real Christianity is relational… and serving. Read Acts 2:43-47 and you’ll see Christians meeting each other during the week, popping into each other’s homes enjoying meals together, and looking after each other in practical ways. Most African Christianity is just a church service. People are in the same room singing songs, praying prayers and hearing a talk. But being in the same room doing the same thing isn’t church. It’s what goes on in any office! Without relational times together it is hard to know what struggles are going on in people’s lives in order to support and serve them. Instead, you dress wonderfully, drive your Mercedes (not everyone needs the minibus), and show you are outwardly impressive… but relationships are superficial. Third, real Christianity is accountable… It’s good to be humble and admit we don’t always live for Christ, and we need our Christian family to spot when we’re not consistent. In 1 Corinthians 5 there’s a guy who’s sleeping with possibly his step-mum. And it’s a local scandal. It is reported to the apostle Paul who challenges them about this. But if someone’s travelled a distance to come to a church service, it’s much easier to hide our inconsistencies at home. No question are asked about how we’ve lived Monday to Saturday… as long you look the part on Sunday. And hidden from view are materialistic dads, domestic abuse, and sexual immorality (often rife in my experience amongst church attending young Africans). No one will point out there is no way you can be a Christian if you are having a sexual relationship with someone other than your spouse. Fourth, real Christianity is evangelistic. When Paul went to Philippi, he wanted local people to become Christians. The church he formed came to be known as the ‘Philippians’. Paul once summarised his evangelistic approach as becoming a Jew to win Jews, and becoming a Gentile to win Gentiles to Christ. He’d change to become like the local people he was seeking to win. But when Africans come to town there is no strategy to engage with local Brits. The nature (and volume) of their meetings is entirely geared to their culture and alien to locals. Their approach is the opposite to Paul’s. Brits will have to become Nigerians etc to fit in. It also follows that if you are travelling a distance to church, the neighbour who may be interested in what you believe, will not have somewhere local to go. S/he will also have to put in the miles! African Christianity, unlike the real thing, will be short term. Reunions are good for those who want a weekly fix of Africa. But the next generation of African youngsters have other things on their minds. They politely respect their parents’ customs, but sit lightly to them. Young Africans will become increasingly secular (although probably still using ‘God vocabulary’). However secular people are often more open to God’s amazing revelation of himself in the Bible than ‘Christian’ church attenders. And as they find their way into a Christian gathering of that is multi-racial, that they’ll see the real Christianity that makes heads turn in the heavenly places.